These simple and sturdy Wall Mounted Flower Box Brackets come in four sizes to fit a wide range of planter sizes. 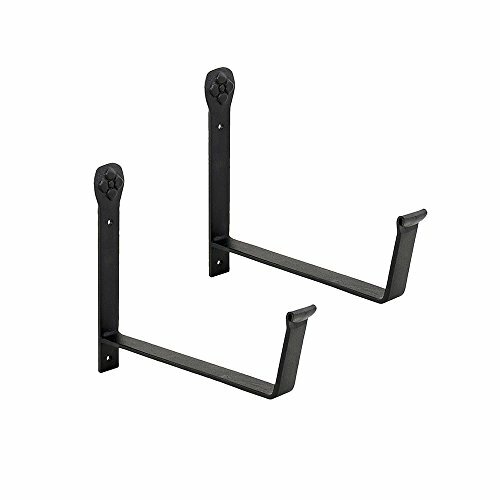 These paired brackets are affixed individually to the wall or rail according to your desired spacing. The flower box is securely captured within the front and back rails. A small floral detail tops each bracket. Use SFB-01 with Small Galvanized (C-08) and Small Copper Plated Flower Boxes (C-08C) Use SFB-02 with Medium Galvanized (VFB-05) or Medium Copper Plated (C-20C) Flower Boxes or Embossed Flower Box (C-04) Use SFB-03 with Large Galvanized (VFB-06) or either Large Copper Flower Box (C-21/C-82C) Use SFB-04 with larger flowerboxes.